When will a MX5 portable version link be sent? I am waiting from my email. I've in VIP2. I also cannot install anything on this computer but I can run a portable version. From what I've read, I've only seen people talking about the installer version. That won't let me participate. I need a portable version. I beleive others have also raised this question in different unrelated threads. I'm a VIP3 and haven't received an invite in several of the email accounts I use, but I can't remember which account I used to preregister. I did download it from a link that has since been removed here in the forum and you are right, it was an installer rather than portable. I have no idea if a portable will be available to use when it is released. Edit: By the way, it was a Chinese version with no option to switch language. Maybe that's the holdup for international version. (although settings and such did convert to English but infobox articles were still in Chinese. FWIW, there are some 5000 posts in the Chinese forum regarding M5, many of them have yet to receive notification. Although probably as many have received them. I don't want to instill alpha or beta. I use only portable version for test. Not so many problems. I have made portable version after installing mx5 version (adding start.ini file in Bin folder and renaming _AppData in AppData). I finally got the link email. But there is no portable version, so it's useless. I cannot install on this computer. I must use a portable veersion. WHENwill it be made available?? It's easy to self made - it's not a rocket science . Open installer by 7 zip (for example), navigate to mx3_data, and extract these files somewhere ( for example new folder called Mx5 portable). 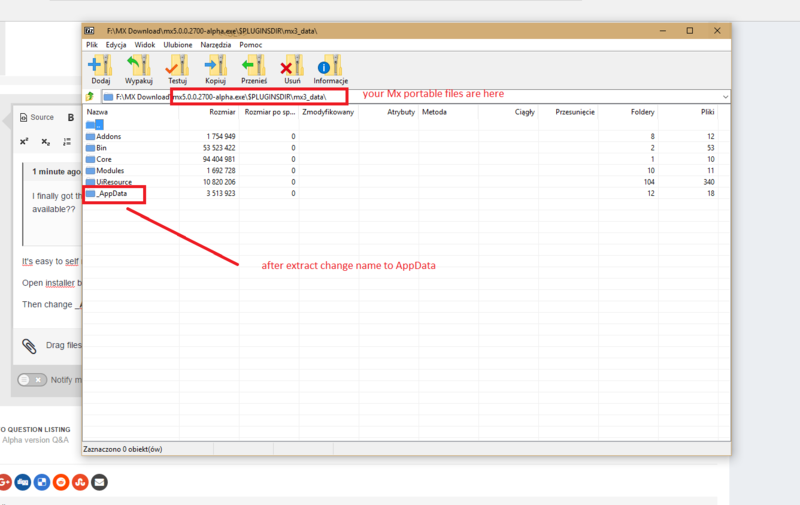 Then change _AppData folder name to AppData. The last thing you have to do is adding a start.ini file to your bin folder. Try to uninstall Mx 5 first. After that try the portable version once again. It will take everything from account folder again. Looks like I need to delete it, but I won't do what. I just wanna have real portable version working without deleting account folder, like MX4 before. I forgot to mention that you have to add start.ini file to bin folder.